Home Reptiles Bearded Dragons What Makes an Albino Bearded Dragon Special? For those who love unusual or rare pets, you might be interested in learning about what makes a White Bearded Dragon special, if reptiles are your thing. There are 9 different species of Bearded Dragons, which originate from Australia, so read on to learn more. Take one look at a Bearded Dragon and you’ll feel like you’ve teleported back in time, to a place where real dragons once lived. Their genus is called Pogona and if you’re wondering about lizards having hairy beards, think again. The undersides of their throats have lines of little growths that look like a beard. These beards turn black if the lizard is frightened, stressed or if they come across a potential rival. Adept at climbing, Bearded Dragons spend most of their time in bushes, perched on branches, basking on rocks in the mornings and afternoons and they can be found near human habitation in the wild. That is, of course, if you live in Australia, especially in regions where there are shrublands, deserts and woodlands with Eucalyptus trees. Bearded Dragons are popular pets and Zoo exhibits due to their hardy nature and how easy they are to care for, in comparison to other reptiles. Breeders love to create hybrids which can produce specimens with several different colors and pattern variations. They also love to come up with a wide variety of names to describe them, such as citrus for yellow, fire or blood for red and so on. If the lizard is saturated with only one color, they are considered rare and can be expensive to buy. If you’re looking to buy a Bearded Dragon online and see one described as a “fancy morph” don’t be fooled. Morph is a descriptive word for the traits, not the color. Some online sellers sneakily photoshop their pictures to make their Dragons appear more colored or fancy, to lure unsuspecting buyers. Watch out for altered photos and consider that lighting can change the brightness or hue of the specimen. As mentioned before, crazy names are also used to arouse interest, such as “Super Citrus Tiger Morph”, so do some investigating before choosing your pet. When Dragons are mated for their pale coloring, they can result in lighter or white specimens that are given names like ice, snow or blizzard. Through many generations of selective breeding, the white coloration occurs due to the various genes working together and not by a single genetic mutation. The notion that there are genuine Albino Bearded Dragons available for sale is false. The general consensus is that true Albinos do not exist in the Bearded Dragon world. Albinism means having red eyes and lacking in melanin production. 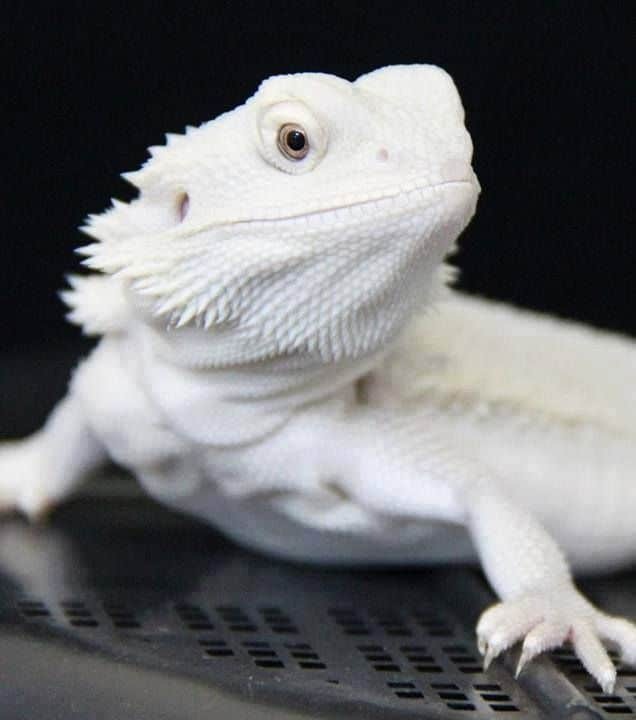 While some breeders insist that they have successfully bred Albino specimens, it turns out that their baby dragons do not live past a few weeks’ old, since Bearded Dragons must have time in the sun for UVB absorption and Albinos must avoid the sun. It follows that viable strains of Albinism that produce healthy dragons have not been achieved to date. Leucism is another form of Albinism, which occurs in Bearded Dragons who have significantly reduced levels of melanin. Leucistic animals can be lighter than the regular colors, white or patchy and they don’t have red eyes like true Albinos. This category includes colors called Witblits and Zero. Bearded Dragons without patterns are called Zero, which is one of the 3 different mutations that result from recessive genes. They’re a silvery off-white color that can also include grey or darker silver. Patches of color may appear when they spend time under a heat lamp, becoming lighter as they warm up. When Witblits and Zeros are bred, the resulting babies are called Wero. White and without patterns, they resemble Zeros but can have blotches of darker color that occurs on their backs and tails. What Makes a White Bearded Dragon Special? The pure White Bearded Dragons are striking in appearance and their special quality comes from the long genetic process that brings them into existence. They possess the same characteristics and behaviors as other Bearded Dragons, but some would argue that they have their own unique traits. They love to exercise and explore, so if you’re considering getting a specimen of your own, make sure your home is lizard-proofed and safe. Bearded Dragons are surprisingly docile when cared for properly and they will bond with you when socialized and interacted with. If you get more than one, it’s important to note that the adult dragons can be quite territorial and aggressive. They have their own social hierarchies and aggressive males require their females to be submissive, otherwise they’ll attack them. Alternatively, if you see your male Bearded Dragon bobbing his head up and down, it means that he’s trying to impress the female, but this gesture is also used in aggression, which can be confusing. Extreme behavior can include hissing, inflating and darkening their beards and jerking forward. In the presence of larger males, smaller Bearded Dragon males will wave their arms as a sign of submission and the females will do the same and lower themselves to the ground to avoid an attack. You can read more about the many types of bearded dragon behavior here. If your desire to own a Bearded Dragon is keen and you’ve considered what makes a White Bearded Dragon special, you might want to find a reputable seller or breeder to get one of your own and learn more about these fascinating creatures.